The internal comms campaign, which is being run by Novo Nordisk’s regional office for the Europe East and South business area, features the strapline "We are aware. We care." Staff at 20 offices in the region are being targeted by the campaign. They are being informed that cardiovascular diseases are the world's leading cause of death, responsible for an estimated 17.9 million premature (under the age of 70) deaths every year, according to the World Health Organization. One in four of these deaths is a heart attack. A core message is that unless their heart is defibrillated – given a controlled electric shock to restore its normal rhythm – people who suffer an cardiac arrest are more likely to die as a result of it. 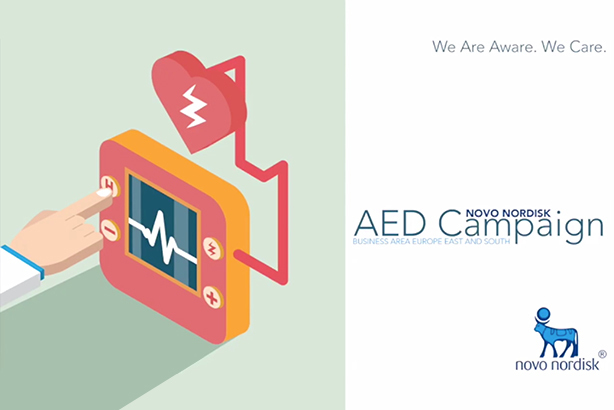 The campaign, which started in February, is seeking to ensure that all Novo Nordisk offices in the European region have an automated external defibrillator installed in their reception area, and have staff trained in their use, by the end of this year. So far, Novo Nordisk’s offices in Slovenia, Slovakia and Poland have joined the campaign. It is being communicated through emails to staff in the region, as well as a closed Facebook group, and updates from Blaz Mrevlje, a medical manager at Novo Nordisk who is leading the campaign, on LinkedIn. Campaign materials include a training video to show staff how to use a defibrillator, as well as a short film in which medical experts explain the risks of cardiac arrest. The success of the campaign will be measured by the response from the company’s offices, according to Mrevlje, who is based in Noro Novodisk’s Poland office. He said: "Colleagues throughout the region are getting more and more actively interested and have already come up with some of their own initiatives and ideas, such as to organise hands-on training sessions for smaller groups, [and] to collect images of AEDs in public places to boost the campaign." Big pharma posted less on social last year, but which firm got the best engagement? Which pharma firm has the healthiest presence on social media?